Bread has been the basis of human nutrition for thousands of years. It symbolizes mother earth and is part of our most antique traditions. I remember my grandfather who would not eat dinner without a piece of bread to accompany every meal. Unfortunately in his later years, fresh bread was no longer easily accessible but he was there, at the head of the table with two pieces of wonder bread, next to his fork. 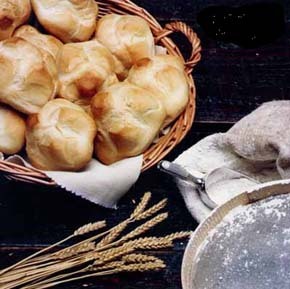 Today, bread is an outcast; fad diets of no carbohydrates and allergies to yeast have further deteriorated our knowledge of this basic element. Our culinary culture dedicates itself to the exotic special effects of mixing and matching ingredients from numerous cultures. We watch with fascination Food Network as the Iron Chefs battle to make several course dishes with a myriad of helpers in an hour. 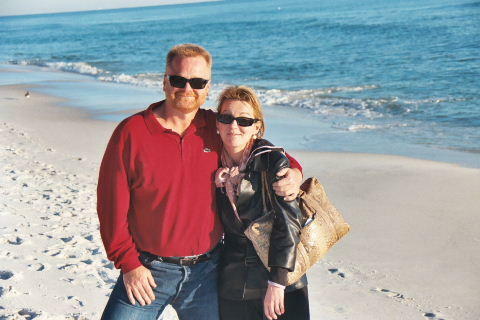 We search the web for recipes of Tyler Florence’s Italian red cream sauce with peas and buy his Italian seasoning hoping to recover some of the good aspects of good food, friends and wine, but we have forgotten the simplest and most satisfying elements, bread. For those who love bread, who are embracing the antique traditions, each bread has its own personality. The ingredients may be the same but the temperature of the oven, the way the bread is shaped, the amount of time the dough rises, all influence the end product. The amount of surface area, the thickness of the crust, even the sound the crust makes as the warm bread is split open accentuate the personality of the different breads. The Rosetta is a simple dough: flour, yeast, water and a pinch of salt. 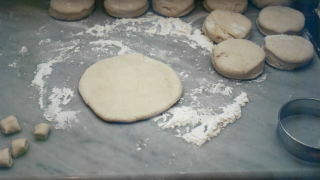 After a two hour rise, the dough is flattened and folded and allowed to rise again. Once baked it starts to open like a spring rose. The five petals swell and push upwards and outwards, creating little morsel of marvelous, sumptuous bites of flavor. Mix the salt together with the flour. Dissolve the sugar in the warm water. Stir in the yeast and let stand for 10 minutes. Place the Biga in a mixing bowl. Add the water-yeast mixture and stir together. Stir in the flour-salt mixture and knead for 5 minutes (10 minutes if done by hand). Place the dough in a lightly oiled bowl, cover with plastic wrap and a towel and let rise for 2 hours. Place the dough on a lightly floured, hard surface. Flatten by hand to about 1 inch thick. Cut 10 equal pieces of dough with a 3 inch diameter disk or glass and set aside. There will be just enough dough for a half roll. Press the dough together and roll into a long thin log. The girth should be that of the man’s pinky finger. With a knife, cut the log into 10 equal pieces. Place one disk of dough into the center of the work area. Roll with a rolling pin to ¼ inch thickness maintaining the circular shape. Place the left hand index finger in the center of the circle. With the other hand, fold the top of the circle to the left hand’s index finger and press. Rotate the dough 45 degrees and repeat. Continue until the last fold (should be the fifth) is simply a triangle. Close in both sides of the triangle and pull the last fold into the center and press. Place one of the log cuts in the center and turn the rosetta upside down and let sit for 30 minutes. Repeat for the remaining nine disks. Once the rosette have rested for 30 minutes, place parchment paper into two baking pans. Place 5 rosette in each pan, folds up. Leave at least 2 inches between the rolls. Cover with plastic wrap and a towel and let sit for ¾ hour. Place the baking sheet in the center of the oven and bake for 28 minutes. Check for the appropriate golden brown color. If you desire a darker roll add an additional 2 minutes. Cool on a rack or in a bin. Once the bread has cooled for at least 20 minutes, you can break off a piece. It should crunch just like the bread from Italy. I eat one of these for breakfast with butter and jam together with a cappuccino. While heating the milk, I place the roll in an oven toaster for 5 minutes at 200 degrees. Is the Rosette recipe create a hollow interior? Anon a small cavity will form at the center of the roll. The empty roll is the michetta from Milan. I have tried to make the michetta at home but is very difficult without a professional steam oven.